Ingolstadt, 08.11.2018: The PEAQ PDR360 may be a musical all-rounder, yet thanks to its distinct design and clearly laid-out controls, this versatile digital radio is completely intuitive. Equipped with DAB+ and an FM tuner, Wi-Fi, Bluetooth, aux-in and USB ports, and a CD player, the PDR360 leaves nothing to be desired. What’s more, the price sounds as good as the PDR360 itself! Costing €189.00 (RRP), PEAQ (an own brand of MediaMarkt and Saturn) has launched a digital audio all-rounder for an unbeatable price. 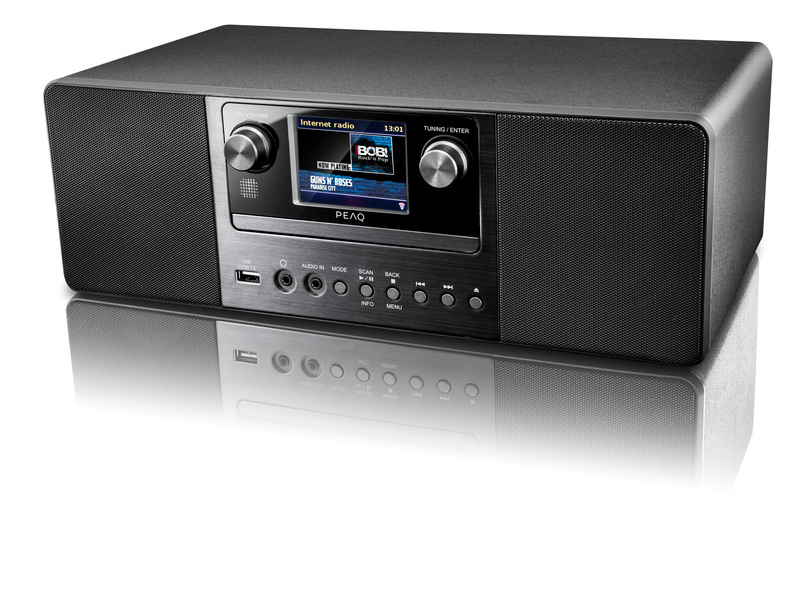 The PEAQ PDR360 combines Internet, DAB+ and FM radio in a compact unit. In order to keep track of the enormous variety of stations, it comes with 30 presets for each of the three radio functions, so you can switch to your favourite stations in a jiffy at the press of a button. The telescopic antenna ensures reliable radio reception, both digital and VHF. In areas where DAB+ coverage is inadequate, you can still listen to your favourite broadcasters on FM. Thanks to the integrated Wi-Fi interface, the PDR360 can easily be integrated into your Wi-Fi network, allowing access to countless internet radio stations. Using the remote control, owners can easily navigate through the huge selection and even search for specific stations. In addition to the various radio options, the PEAQ PDR360 offers connectivity options for additional audio sources. For example, the Bluetooth function means it can be wirelessly hooked up to mobile devices such as smartphones and tablets. The 3.5mm aux-in port makes the PDR360 compatible with other devices. The USB port can be used for audio playback as well as for charging smartphones and the like. Those who don’t want to give up their CD collection just yet will be delighted about the built-in CD player, which as well as standard discs also plays the formats MP3, Real Audio, WMA and AAC. 2 × 5 watts RMS and the two bass reflex ports on the back elicit a rich sound from the PEAQ PDR360. The mids and highs are clear and detailed. Using the onboard equalizer, the balanced sound can be tweaked to your own preferences. Yet despite its ample features, the PDR360’s external design is elegantly understated. Its matt black wooden casing is adorned by a generous colour display, making it easy to operate and with enough space for additional information. The PEAQ PDR360 is available exclusively from MediaMarkt and Saturn as well as online at www.mediamarkt.de and www.saturn.de, and has an RRP of €189.00.